About a week ago, I blogged about my introduction to Kettle Bells. Since then I have read so much about this simple but mind blowing form of training. Pavel Tsatsouline, is an expert in the area. A complete legend. I rate professionalism very highly, I love meeting people who know their thing, who are good at their job, believe in what they do and are committed to it. 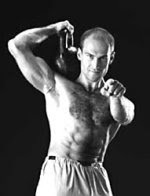 I was reading about some Kettle Bell training techniques and realised they were word for word, movement by movement exactly as BC tells me. I then realised that I have come to expect nothing less. It blows my mind. This is not about compliments...........its about RESPECT. On Sunday, I twisted to pick something off the ground and I hurt my back. The worst of the pain is in the past, but I still have a few twinges, I felt sick that this may put my training back. In a few weeks I am off on holidays, so I will get some rest from weights. Maybe this will be a necessary break. But I hope that I can pick things up, as I have some targets. Perhaps get stuck into clean and jerk.